We believe, by Scripture, that the Biblical church has four key elements to it and that at the center of the church are two primary foundations. 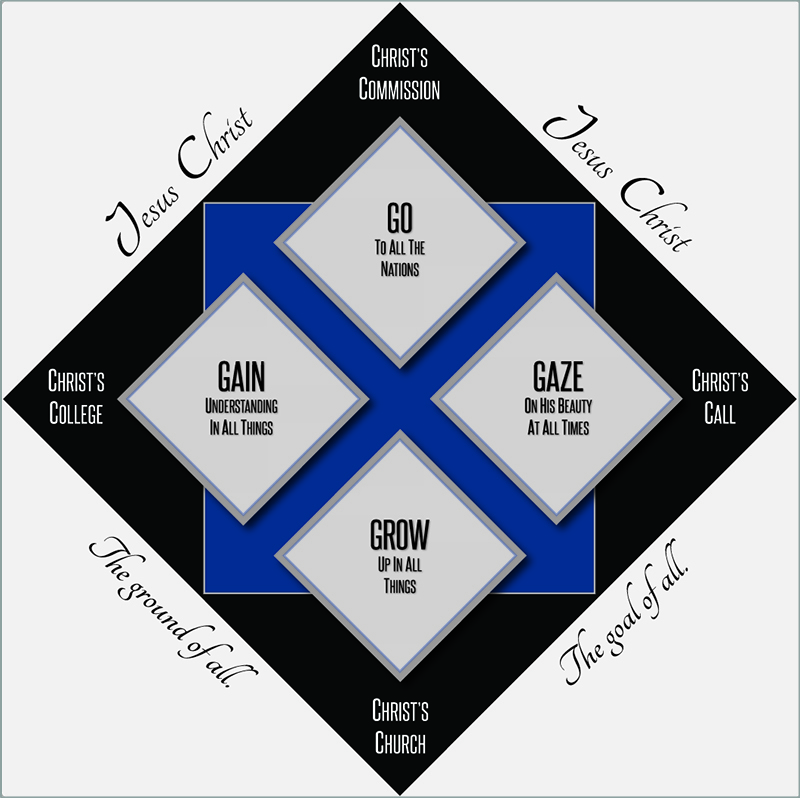 Those foundation are: 1) We believe that Jesus Christ is the ground of all that we do. Christ, as eternal King, is the foundation and the cornerstone that our church is built upon. We come to the Father God through Jesus Christ by His atoning work on the cross and everything we do is empowered by His Spirit that He sent for us. 2) We believe that Jesus Christ is the goal of all that we do. His glory is highest in our lives and we live to magnify Him. In our community and in our individual, spiritual lives we look to do all things, in accordance with scripture, to point to the infinite worth and beauty of Jesus Christ. While our actions are a response to His great work in our lives, we continue to work, endure and persevere to glorify His name. As the local church joins together under the headship of Christ, we love to grow in our discipleship and sanctification because we want to look more like Christ. As a church we grow up into all things and become stronger in our faith in the One True Savior. We grow in holiness both as a testament to the work of Jesus in our lives and as a praise to His glory for His faithfulness to us. Through the preached Word, worship, fellowship and discipleship we grow as Christians to be ready on that day when we might see God face to face. God is worthy of our worship. And not only is He worthy, but He is glorious, beautiful and desirable. We love to give our attention to God because He is the desire of our hearts now that He has saved us. In our worship, which includes every area of our lives and every part of our church, we gaze upon the perfection and beauty of Jesus Christ. Not only is He worthy of it, but we desire to do it. This idea of gazing upon the Lord shapes how we live and how we do church. In our worship services we long to be more and more Christ centered in our praying, singing, teaching, learning and interacting. We long to see that we so dearly love. The riches and knowledge of Christ are deeper than we can fathom. There is so much to know about God that we are unable to have full knowledge of Him on this side of heaven. Even in His presence there will be an infinite source of new knowledge of His love, holiness, grace and mercy. While the complete knowledge is beyond us, we as a church are called to seek after what he has revealed to us at this time. We are called to gain knowledge and understanding about this infinite Creator God. We seek to read the Bible, teach the Word and search out Him in all our knowledge, wisdom and understanding. We, as a people, love to seek after knowledge of Christ and to share that with all those around us. The mission of the church reaches every corner of the earth. That means that in our local community, as well as internationally, we are about the Gospel going to all people. The proclaiming of the Gospel of Jesus Christ takes place in our neighborhoods, workplaces and families. It also takes place as we partner with ministries internationally and send our own people, whom God has called, to this great Gospel work. The Great Commission shapes how we interact with the world and how we long to see more people come to know Christ. As a church we are dedicated to seeing the mission of the Gospel happen all around us. In our giving, our praying and our going, we long to see the glory of God lifted high in every place.